A tire blowout can be a scary and stressful experience. Even if it does not result in an auto accident, you are still stuck stranded by the side of the road. At Recovery 1 Towing LLC, we provide flat tire service that is always available when you need it. Our roadside assistance and towing company offers tire change services in Upper Marlboro, MD, and the surrounding areas. Having tires in good condition is a huge part of driver safety. Your tires should be properly inflated and the wheels aligned in order to maximize control over your vehicle. The best way to do this is to check the tire pressure on a regular basis and bring your vehicle to an auto shop for a wheel alignment from time to time. When you need our flat tire service, we can either patch your tire or use your spare as a replacement. Always make sure your spare tire is serviceable. Sometimes we can't patch a tire due to the nature of the problem, which makes having a working spare all the more important. If you don't have a spare tire and the damaged tire can't be patched up, we can still tow your vehicle safety to an auto repair shop. 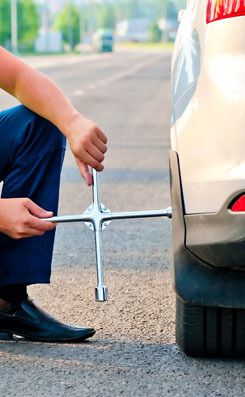 Our roadside assistance and towing service is always here to help when you have a flat tire. Has a flat tire caught you by surprise? Unfortunately, it is impossible to anticipate the moment you suddenly get a flat tire. At times like this, it is good to be able to reach out to our tire change services for 24/7 assistance. Our average response time is 35 to 40 minutes, and we know how to repair or replace tires very quickly. This means you are not waiting all day to get where you need to go just because you have a flat tire. Contact us today if you need us to take care of your tire problem. We proudly serve Upper Marlboro, Landover, Brandywine, Shelton, and Largo, MD, as well as the surrounding areas.